Safety first: the horses and riders you can see from miles away! Being able to be seen while out hacking is always important, but as the nights draw in its even more crucial to be as visible as possible. Helen Elliott took the opportunity to get kitted out at Horse of the Year Show ready for some winter hacking. “I spy a hi-viz pony!” she laughs. 2 A lot of yellow! Darker coloured horses can easily be missed out on the roads, particularly as the nights draw in. But that won’t be happening any time soon for Anne-Marie Cronin, who we won’t be losing any time soon in their yellow outfit! Miki Waddington made sure to carry on good practises when riding out with a friend visiting from Mallorca. 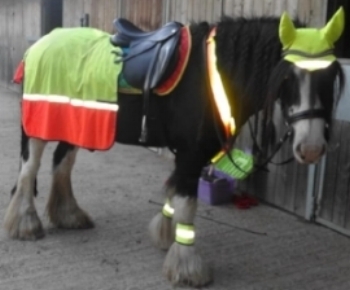 Until a small enough pony one can be found, Arya is using a hi-viz dog rug! Jackie Williams, Philippa Havill and Louise Gorman headed out in style for a 3 mile ride, wearing pink, blue, orange and yellow! “We received lots of compliments on our bright outfit!” laughs Katie Amelia about hacking out on her horse Marcus, in an orange exercise sheet and green ear veil. 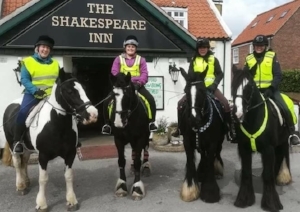 Linda Anderson, Suzanne Jane, Sammy Collins and Rachel Fraser rewarded themselves with a pit stop at the pub after an 8 mile ride. “It would have been rude not to!” says Linda. It’s always good to start as you mean to go on, as Charlotte Oram and her horse Jack often head out in an orange ensemble. Mike Mills has been clocking up the miles on his mare in Wales, who can be picked out from the crowd by their trademark orange ear veil! In a fashion statement that didn’t catch on, Paula Needham’s gelding decided to take it into his own hands to make sure they were prepared for their hack. 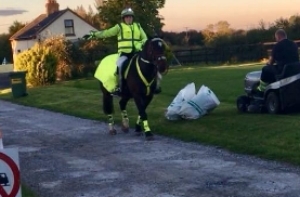 “He decided we didn’t have enough orange hi-viz ensemble, so he added his own!” says Paula about her horse’s decision to try and wear his feed bucket!